A worker turning a valve at an underground gas storage facility near the town of Striy in western Ukraine in May. KIEV — Ukraine's parliament agreed on Thursday to discuss a bill to allow gas transit facilities to be leased on a joint venture basis with participation from firms in the European Union or the U.S.
Ukraine would hold 51 percent and foreign partners would be offered 49 percent in the venture, which would manage both transit pipelines and underground gas storage facilities. Suffering a third cut-off of natural gas supplies from Russia in under nine years, and with bilateral relations in crisis, Ukraine is desperate to become less dependent on Russian gas, but at the same time to provide more reliable transit for the Russian gas that Europe needs. The government said the joint venture would bring in investment and remove the need for the South Stream pipeline, which Russia's Gazprom is building to take gas to southeastern Europe across the Black Sea, avoiding Ukraine. It would also aim to boost Ukraine's capacity to receive "reverse flows" of Russian gas re-imported back from EU countries. "If Europeans join this company, Russia will not build South Stream," Prime Minister Arseniy Yatsenyuk told parliament. No date was set for discussion of the bill. South Stream has fallen foul of EU competition authorities, who object to the fact that it will not be open to other gas producers. However, a number of EU countries including Germany, Austria and Bulgaria are strongly in favor, and European Energy Commissioner GЯnther Oettinger said Monday that it was a project the EU could accept. If it is built, the pipeline threatens to deprive Ukraine's badly strained budget of the transit fees that it currently receives from Russia for gas heading towards Europe. The EU imports 30 percent of its natural gas needs from Russia, and about half of that comes via Ukraine, with some already having been diverted through the Nord Stream pipeline under the Baltic Sea. Its supplies were briefly cut off in 2006 and 2009 when Ukraine argued with Russia about the price of its gas. The flow to Ukraine has now been cut off again after Kiev refused to accept a price rise imposed by Russia following the ousting of pro-Moscow President Viktor Yanukovych in February. However, Ukraine, whose new president Petro Poroshenko plans this month to sign the association and free trade agreements with the EU that his predecessor shunned, has continued to allow transit gas to flow normally across its territory. Oettinger, who has been mediating in the dispute, has said he hopes to bring both sides back to the negotiating table by mid-July. 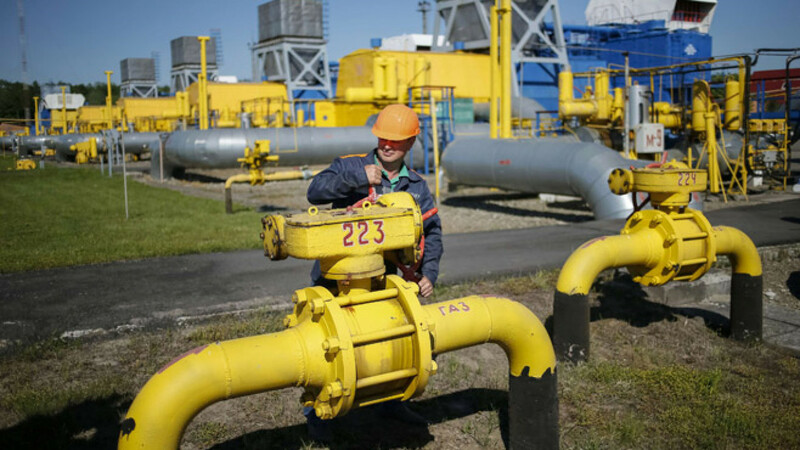 For its part, the EU has tried to support arrangements for Ukraine to be able to re-import Russian gas back from other parts of eastern Europe, to help it offset in part any disruptions to supplies from Russia. Ukraine, which consumes about 45 billion cubic meters of gas a year and supplies just less than half that from its own production, has said it expects to receive about 6 bcm in reverse flows from EU countries this year. Yatsenyuk has said total gas volumes shipped to Ukraine from the EU could reach 15 bcm a year. In April, Germany's RWE began deliveries via Poland under a framework that allows for delivery of up to 10 bcm of gas per year. And Slovakia has agreed to make technical adjustments to an old unused pipeline so it can ship over 3 bcm of gas a year, rising to up to 10 bcm from next spring.